Okay Smart Guy, What About Pottstown and Phoenixville? In my previous post I spoke of one way in which the fundamental reality of Transportation has begun to flow in a positive direction for Norristown/Bridgeport, Pennsylvania. This is the under-construction “Lafayette Street Expansion Project,” the best news to arrive at this point along the Schuylkill River in quite some time. 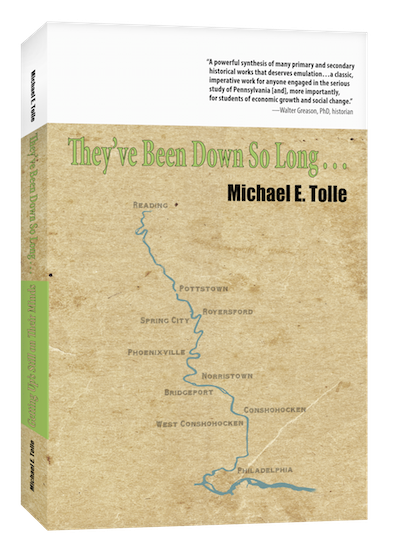 I concluded with an introduction to my next subject, how Norristown can take advantage of the quite favorable condition of its most fundamental reality, The River, the very reason the town was built in the first place. I will flesh out that subject in my next post, but first I need to clear up some questions involving the relationship between limited-access highways and town revival. The central point of my introductory post in this series about Norristown/Bridgeport was the claim that upcoming access to a limited-access highway could be the needed spark for revival. I referenced the Conshohockens to support my point. Those two neighboring boroughs do so in spades, as they connect to not just one such highway, but at the intersection of two, and the result has been a remarkable influx of both businesses and residences. So far, so good. But two questions should occur to anyone following my theme. First, wasn’t Pottstown the target of a new limited-access highway some years ago? It doesn’t seem to have helped much. Why Not? Second, and more broadly, how do I explain Phoenixville? The Borough thrives in the absence of any “access to transportation” as I have defined it. So how important is “access to transportation,” really? These are pretty much the two polar ends of critique, and both raise valid questions. I have already addressed both subjects, in diametrically opposite ways. I can explain the first, but admit to having but a few clues as to the second. That’s why I’ll discuss Phoenixville first. “Access to transportation” does not guarantee revival, and as Phoenixville demonstrates, is not even necessary. It is, however, the event most likely to set a revival in motion. The revival of our old industrial towns can have many sources (although “industry” isn’t one of them), a fact that has been amply demonstrated already and continues to be. More fundamentally, I also contend that no one component—even “access to transportation”—is sufficient by itself; they must interact in a positive manner. That was the final message of my previous post. I must also admit that I have decidedly mixed feelings about gaining a town’s connections to a limited-access highway. There is much to be gained, but much is going to be lost. The Conshohockens demonstrate why I am concerned, as old Conshohocken and its long-time residents are being overwhelmed by the influx of new people, whose view of the borough and their responsibility toward it differ markedly. “Old” Conshohocken knew what it was and was proud of it. Can a new consensus self-image of Conshohocken emerge, and what would it be? Still, as I observed previously, five of the boroughs upriver—Norristown, Bridgeport, Royersford, Spring City and Pottstown—would love to have even a small version of Conshohocken’s problems if they replace some of the current ones. But Phoenixville is literally a case of its own, with a revival that has nothing to do with a new connection to one or more limited-access highways. Nobody moves to Phoenixville because of its access to Southeastern Pennsylvania’s network of major roads, but they have been moving nonetheless. I have published a series of posts—some of them guest posts—about the Borough’s revival, all beginning with that same question: Why? That’s because I don’t know why Phoenixville—alone among the towns on the lower Schuylkill River—has enjoyed a locally-based revival. Thus I seek answers from residents who have experienced the change. The response has been excellent, but I am by now means done; there is so much more to learn. I will return to this subject, and continue to invite your thoughts and comments on this fascinating issue. I will address it specifically during my talk in the Phoenixville Public Library (co-sponsored by the Historical Society of the Phoenixville Area) on Monday, April 11, and look forward to hearing from those who have actually lived through the process. Potttstown’s situation is much easier to explain. In fact, I already have, in a post published on February 20, 2014. I include the link below, but here is my basic point: The “Pottstown Expressway” does not demonstrate the failure of a highway connection to revive a town, because aiding Pottstown was not its intended purpose, as its design demonstrates conclusively. Although the new highway was pitched as a lifeline to an ailing borough, that was just for public consumption, as public taxes would pay for it. The highway was designed from what me might call a broader viewpoint. It was the final component of a new U.S. Route #422, to replace an overburdened Germantown Pike. The whole point was to bypass the towns that Germantown Pike had always served, Pottstown being only the largest of them. Its true purpose was to provide access to the land between King of Prussia and Pottstown, first for developers and then their customers and their customers’ customers. That stretch contained a substantial amount of “buildable land” back then, much of which has been since built on. The new U.S. Route #422 did the job it was designed to do, as everyone who sits gridlocked on the highway during rush hour(s) should understand. Keep in mind also that the road was not even designed to connect to Pottstown, but to the much older “Pottstown Bypass,” making it easier to avoid the town altogether. My post about the “Pottstown Expressway” will tell you what you need to know, but more about public marketing than about roads reviving old towns. The new Lafayette Street/Road, by contrast, is much shorter. Although it will foster development along the stretch of Plymouth Township that it crosses before it gets to Norristown, and maybe even northern Conshohocken, new construction in Norristown was its true goal, unlike that of the “Pottstown Expressway.” Even more important, as I began to discuss last time, is the fact that the new road goes right into downtown Norristown, terminating close to the riverfront. I will return to that subject in my next post, and discuss why that is so important. The primary reason for my optimism about Norristown, Pennsylvania is that it will get “access to transportation.” I include rail transportation in this calculation, but not as a major benefactor, as much as I would like that to be. I’ll discuss that later, but now I want to focus on the much more certain arrival of road “access.” In my first post in this series, I pointed out that “access to transportation” only begins with owning a car. Only a very few people can live along the lower Schuylkill River without one. Once you have a car, the question is where you have to drive to for work, and how long it takes. In the years since the Second World War, the possibilities of both have expanded enormously due to our nationwide thirst for limited-access highways. After the war, Norristown absorbed a very hard lesson about the effects of a transportation revolution on established business practices, and is now belatedly trying to connect to the limited-access road network. The project that hold so much promise for Norristown is known as “The Lafayette Street Extension.” It has much promise for two interrelated reasons: it will give Norristown a true Turnpike exit at one end, and the other end goes exactly where it should to tap Norristown’s most valuable asset: its riverfront. So far, extension is it what has been accomplished, from its previous eastern dead end out to Conshohocken State Road. Old Lafayette Street in Norristown will be widened, but it’s the next extension that is the most important, because that will take the road to the Turnpike. An entirely different project (different funding, different timing, etc.) will then construct a full Turnpike interchange to the new road. This new connection will be the best news to happen to Norristown in quite some time, and could be the key to the town’s long-awaited revival. Do I know for sure that this is going to happen? No, I don’t. If understanding what has happened produced a knowledge of what is going to happen, then historians would be both more influential and much better paid. Norristown’s future is not nearly as simple—or as assured—as I have phrased it above. 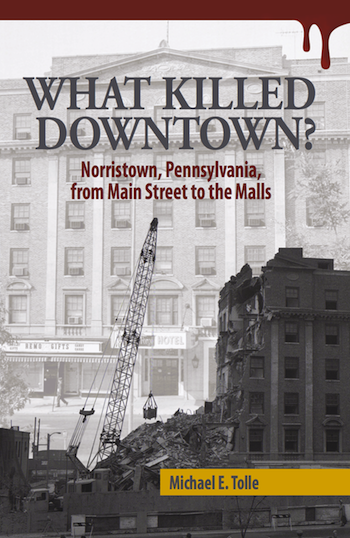 But looking at Norristown’s past—and understanding what happened (as opposed to remembering it)—demonstrates that a great error was made over sixty years ago, and that Norristown’s leaders have absorbed this hard-earned lesson. This is Norristown’s second chance at a Turnpike Exit, and its attitude couldn’t be more different. All of Norristown, from elected officials to businessmen to just plain citizens look forward to the connection. They are not planning to repeat an old mistake. Back in the early 1950s, when the Turnpike extension from King of Prussia to the Delaware River was being developed, the plan proposed an interchange pretty much right where the new one will be built, at the eastern edge of Borough (as it was then). Norristown’s movers and shakers reacted with horror; virtually everyone was against it, and they lobbied hard to move the exit, even traveling to Harrisburg to make their case. They simply did not understand (and, in truth, could not have, given their worldview) that limited-access highways would transform the interconnected worlds of transportation and marketing. Norristown was a railroad town, and tightly woven into the rail transportation network. They spurned the new road. Unfortunately (as it turned out) the Turnpike Commission complied; it abandoned the idea of an interchange at Norristown’s border and moved it about two miles west. I’ve always privately speculated (without any supporting facts, mind you) that the Authority still named it the “Norristown Exit” out of spite, then enjoyed decades of people using the exit and not being able to find Norristown. Be that as it may, things have certainly changed. Back then, they were afraid that a Turnpike interchange would ruin downtown. Well, the interchange was moved and downtown was ruined anyway, so now Norristown is counting on an a real “Norristown Exit” to give it a much-needed shot in the arm. Bridgeport shares in this, as the Turnpike and the location of its interchanges contributed a great deal to the decline of the Borough also. A new connection—even if an indirect one, in the case of Bridgeport—could help reverse that trend. Much has been said already, and much more will be said about what the project could mean. I support it from that outsider’s point of view, at an abstract level supported by ample historical evidence. 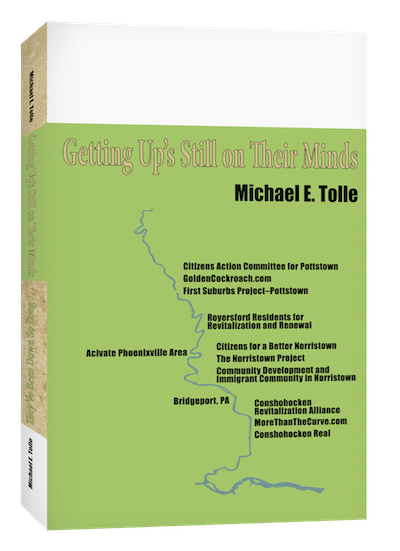 I am optimistic about its potential because, by connecting the Turnpike not just to Norristown, but to its riverfront, the second of the fundamental realities that have always governed life along the river—Transportation--can interact with the first—the River itself—to their mutual benefit, and thus to the Norristown/Bridgeport area. Truer words were never written. In fact, the extent of a “revamped Norristown” will be dependent on how effectively it utilizes its most significant asset, the riverfront. I'll have more to say about this in a later post, but this one is about transportation. So for now, I'll just note that transportation is a means of getting somewhere, and today that somewhere is not just to the Schuylkill River, but along it. There is more to this than just automobiles, and that’s where interconnection becomes even more significant. Connecting to the Schuylkill River Trail is an opportunity that must not be missed, so don’t think of Lafayette Street as just an automobile project; connections to the Trail will also be important. Revival must be a multi-faceted event, and that requires interconnecting and mutually reinforcing efforts. It begins with “access to transportation,” regardless of how you are transported.